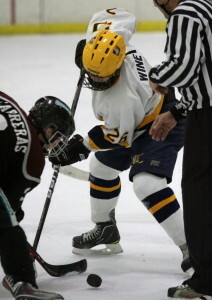 Unionville's Payton Wine battles Eric Carreras for the puck. 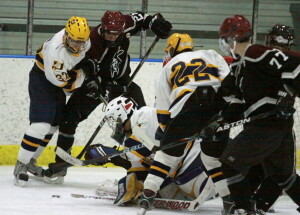 ASTON — Special teams are a big part of any ice hockey game but Monday night defending Ches-Mont champion West Chester Henderson took that to a new level. The Warriors posted two short-handed goals, complimenting a 2-3 night on the power play, en route to a 9-4 win over Unionville for their third straight win. 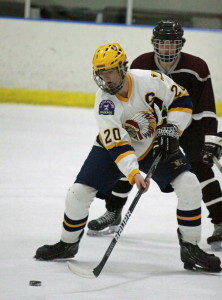 Henderson’s Adam Robson (2 goals, 5 assists) got things started on a seven-point night for the junior forward, by scoring his seventh goal of the season three minutes into the tilt. For the Indians, whose first six weeks of the season have been an adventure to put it mildly, head coach Bill Hammond saw glimpses Monday night of his young squad heading in the right direction. Warriors 2-1 in the last 18 minutes of game time. 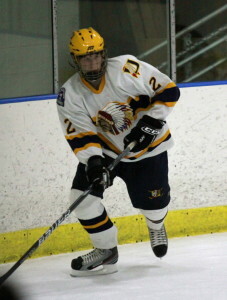 The Warriors (4-2-0 league, 4-4 overall) out shot the Indians 34-16 with sophomore Eric Carreras (3 goals, 4 assists) snagging a hat trick as well, while the hosts built an 8-2 after the second period. The Indians level of play in their own end, which has improved by leaps and bounds in the five games, can be attributed to the communication between sophomore net minder Josh Sedar and his blue liners. “It has gotten so much better as the season has gotten going,” said Sedar. “In the beginning of the year, we had some issues with screening and misplaying the puck in front of the net. My guys back here have been doing such a great job, I have so much fun playing in goal for this team. Unionville (0-5-0 league, 0-6-0 overall) was 0-for-6 on the power play on the night but that result was not indicative of the effort; as they generated four prime scoring chances and seven shots with the man advantage.